Oh No Señor, there's no Internet here! We knew that Internet may not be available much in Cuba, but what we learned is a defining characteristic of Cuban life, the US embargo, and a communist government. Years ago, when we took a trip to dive the caverns in Yucatan, we flew into Cancun and rented a car. Everything went fine until we got hot and tried to turn on the air conditioning. There were plenty of buttons labeled A/C and Fan, and Temp - but nothing worked. Luckily it wasn't too too hot, and the windows did work. We survived, but we made sure to tell the rental agency when we returned the car that the air conditioning didn't work. They looked at us quizically, and said,"Oh no Señor, there's no Air Conditioning!" Apparently we should have known that their cars were simply not equipped with A/C regardless of the buttons on the dashboard. That has become our ongoing, inside joke ever since when something doesn't work! 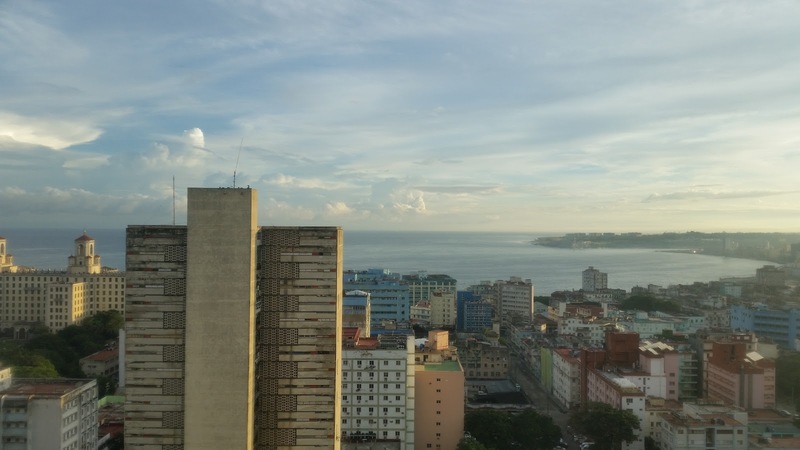 For Cuba, it has become, "Oh No Señor, there's no Internet here!" The hotel's Wi-Fi hotspot was on the 2d floor, period - no access in your room. We were pleasantly surprised at the speeds. Nowhere near as fast as what we're used to, but much better than we've experienced on cruise ships. There was one weird thing - we could not access our PayPal account. Access Denied! I thought maybe it was blocked by the government so as not to allow transfers of funds - and that may be the reason - but we were able to access our regular bank accounts with no problem. And, we seemed to have full access to any social media sites we wanted, like Facebook. 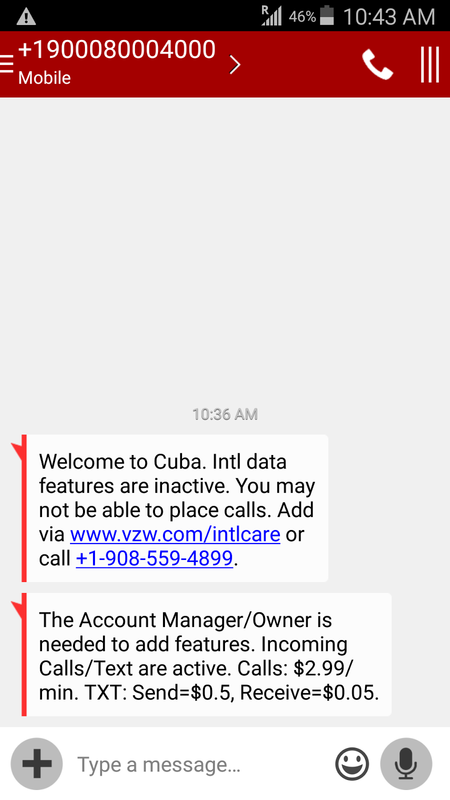 We did actually receive a couple calls and a couple texts during our stay in Cuba, but when we tried to answer the call, or reply to the text, it just didn't work. We really don't care about phone calls or texts, what we need is data - an Internet connection to manage our website and customer emails. We saw people with smartphones everywhere, so we thought we'd investigate buying a local SIM card - like we did in Europe. Yes, indeed, we could purchase a SIM card with service from Cubacel. We were told the price was $40US - just for the card! Not for any service. We were still considering it - not that we NEED the Internet that much, we just consider it part of our job to do this research. But then we heard the final bad news - "Oh No Señor, there's no Internet here!" only voice and text. The cell towers in Cuba are only 2G. You need 3G or 4G for data/Internet. Wow! So, what were all these people doing with iPhones and Android devices? Just voice and text? We learned that just outside the hotel, on a street known as the Rampa because it runs like a down ramp to the sea, there is a public Wi-Fi hotspot. You need to purchase an access code for $2-3/hour. So that's what all these people were doing, sitting on the walls next to the sidewalk, they were accessing their emails, facebook, and using Skype to make calls to the US. But as soon as the leave the immediate area of the hotspot ... Internet gone. They really have no idea what these phones can do since they so rarely have an Internet connection. No signs were necessary to find where the local Wi-Fi hotspot was! Other than the hotel, the Rampa, and the town square in Cienfuegos, we saw no way to get Internet in Cuba. We learned that the people do not have Internet access in their homes at all. One reason is the US embargo. Here is the map that we were shown during our US-Cuban relations lecture that shows all communications lines that go under the ocean bypass Cuba by law. Although the US Embargo definitely limits the communication, the Cuban government also has something to do with it. According to this article from the Economist, in 2009 the Obama administration authorized American companies to provide internet services to the island but the Cuban government wasn't interested. 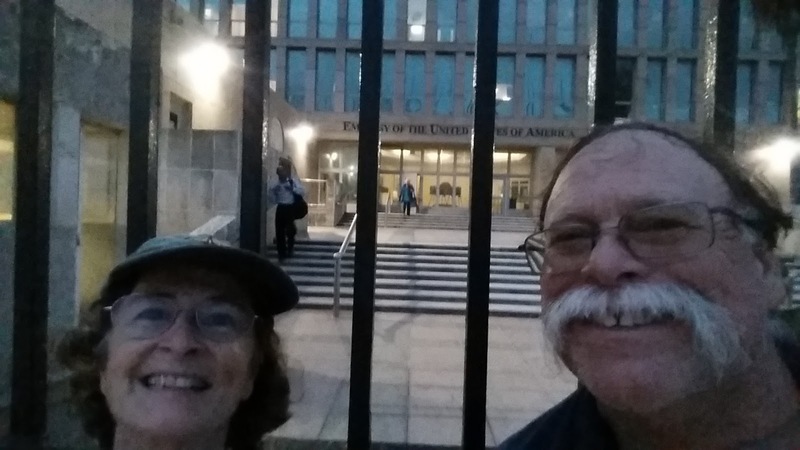 If you followed the events that led up to the re-opening of the American Embassy in Cuba you know that there was an exchange of prisoners between US and Cuba. The Cuban prisoner was a man named Alan Gross - they say he was in a Cuban prison for being an American spy, but do you know what he was doing? Installing equipment for Internet access!! We learned that people who are desperate for Internet information have formed a type of 'sneakernet' called The Package. Someone with Internet access at a business collects a Terabyte of data from various websites and saves it to DVDs or maybe external hard drives? Then they charge $2/week to distribute this "package" to those who want it. $2 may not sound like much, but when a government worker (and most all Cubans are government workers) typically makes $20-30/month, that's a lot of money. A neighborhood might pass the package around and share the cost. I think I also heard this referred to as an IntRAnet. Here's an NPR story on the Cuban Internet Package. We were only totally without connectivity for 4 days - I kind of enjoyed it. My phone was still in my hand most of the time, because it was my camera, and my note taker. I also wrote a few emails, knowing they would get sent as soon as we were back in the States. But, generally not worrying about email or business was nice for a few days. I'm sure going to pay attention to increased Internet access in Cuba though. We would love to go back and spend much more time someday - but we need Internet for that. After 4 nights in a Havana hotel, our tourbus took off for the countryside. 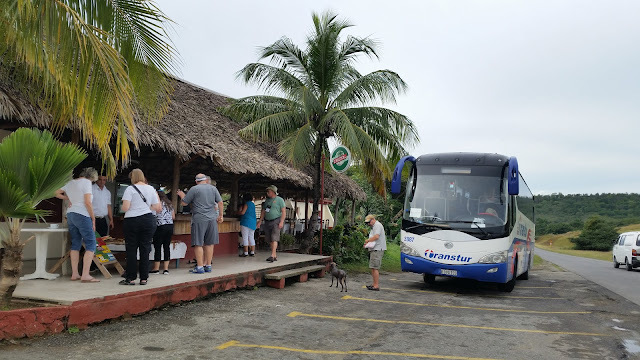 We stopped at the Bay of Pigs, got a history lesson, a swim in the bay, and a fabulous lobster lunch while listening to a lecture on the ecology, wildlife, and wetlands of the huge National Parque Cienega de Zapata. Playa Larga is on the Bay of Pigs. If you're our age - 60's - and American, those 3 words mean something very bad, and very secret. We were just kids when the Invasion at the Bay of Pigs happened, and it is tied, in my mind, to the Cuban Missile Crisis as well. So, hearing "Bay of Pigs" conjures up images of war, secrecy, and nuclear annihilation. What a trip to go for a swim in this lovely Caribbean water called the Bay of Pigs! On the Road, nearing the Bay of Pigs: "Here was a Decisive Battle for Victory"
After our visit at the Bay of Pigs, our group (23 people) got back in the bus and headed toward Cienfuegos where we would stay for 3 nights. For accommodations, our group divided up into 5 groups of 4 to stay in “Casas Particulares” or private homes turned into B&Bs under the new guidelines for private enterprise. The proprietors of our B&B welcomed us with open arms, and cerveza! 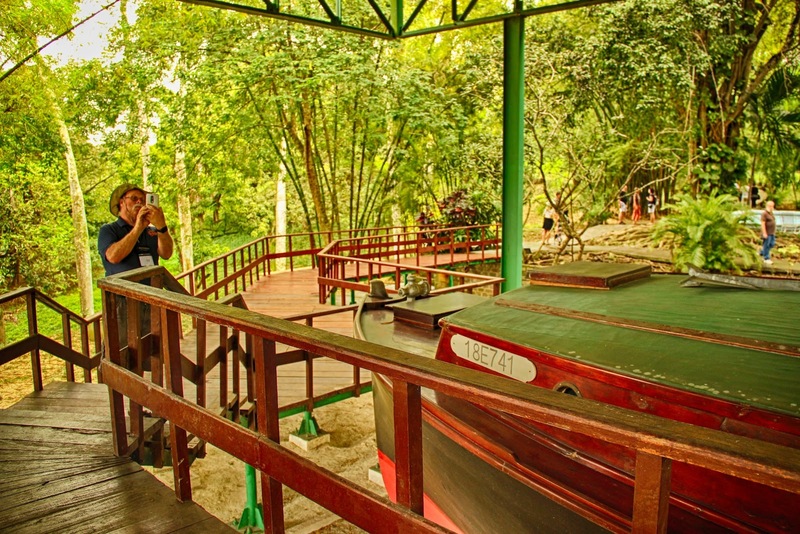 We had to struggle a bit with language since they didn’t speak much english and we don’t know much spanish, but you can feel warmth and friendliness. From Cienfuegos, we took a day trip to Santa Clara and Che Guevara's tomb. A complicated man, revered and despised, but with statues, billboards and pictures of him EVERYWHERE! We heard that the movie Motorcycle Diaries is a good one about Che. We found it on Amazon and watched it as soon as we got back. It's about Che's early days - college age - with a wanderlust traveling thru South America. He didn't seem so different from many friends I know. I need to see a sequel to understand how he turned into a revolutionary. 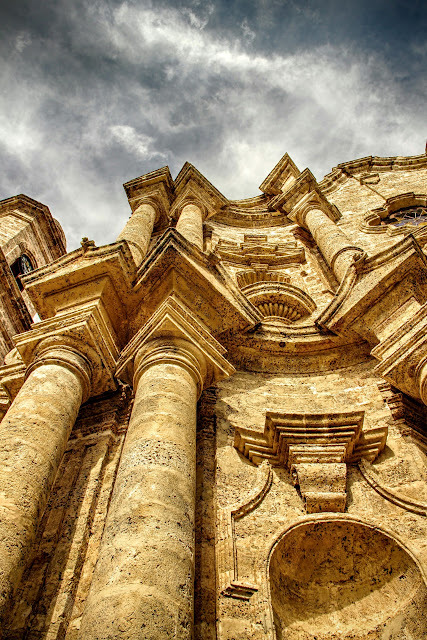 A concise overview of Cuban history and culture. Click to enlarge and read. Cienfuegos city has a beautiful waterfront and town square. Church at Cienfuegos town square. 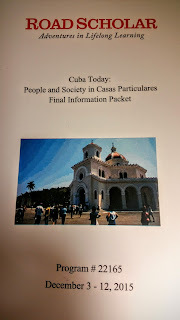 The crown jewel, at least in my book was the last day's trip to Trinidad, Cuba. This is an old colonial city with cobblestone - no make that just stone - roads, narrow streets, and mountain views all around. Even the drive there was the prettiest. And there were good roads. Views along the way. Supposed to be good diving out there too! Gotta come back someday. A special stop in Trinidad was at the Casa Particulare of Lia and Paci, the Cofradia Duo. They showed us their home, told us all about their lives - Lia spoke English quite well - and they even sang for us. Watch the video and enjoy! I LOVED them! TUESDAY Dec 8th - departure at 8:30am... en route to Cienfuegos... lots of great commentary by Ilen Rodriguez-Chou!! Rest stop on en route (5 pilars of rest stop.... coffee, drinks, ice cream, shopping, banos). Playa Largo on Zapata Peninsula and lunch at Enrique's Casa on the beach. Lecture on ecology before lunch, on the terrace of Enrique's home. Time for a swim in the Caribbean! Playa Giron and Bay of Pigs Museum visit. Arrival in Cienfuegos' main square for start of Casa Particular Adventure. We were lucky to have some Spanish speakers on this trip to help bridge the gap with our Cuban hosts! Dinner at your casa particular. WEDNESDAY Dec 9th - morning pick-ups by 9am, drive to Santa Clara (rest stop en route). More educational commentary by Ilen!!! After a stroll along city streets our first stop was at The Senior Center for a wonderful visit and interaction. We didn't want to leave!! Lunch was at Aldaba B&B and Restaurant. Afterwards we visited Che Guevara's Memorial. Siesta Fiesta en route back to Cienfuegos..... we strolled the pedestrian street and stopped in various shops, a visit to Union Hotel, then enjoyed an uplifting performance by Cienfuegos Childrens' Dance Group in the main square. We were lucky to be able to visit Roberto's Art Gallery (thanks to Helenmarie and John for sharing!!) before walking to El Largarto on the waterfront for dinner. Return to our casas in time to fall into bed. THURSDAY Dec 10th - Early morning pick-ups from Casa Particulars... drive to Trinidad (rest stop en route, of course!) Tour of main square and cobbled streets of this quaint town. Visit to cooperative Crochet House. Time to explore Trinidad's sights. Visit to private B&B with Lia and Pace. Treated to a sample of their music and tour of their home. 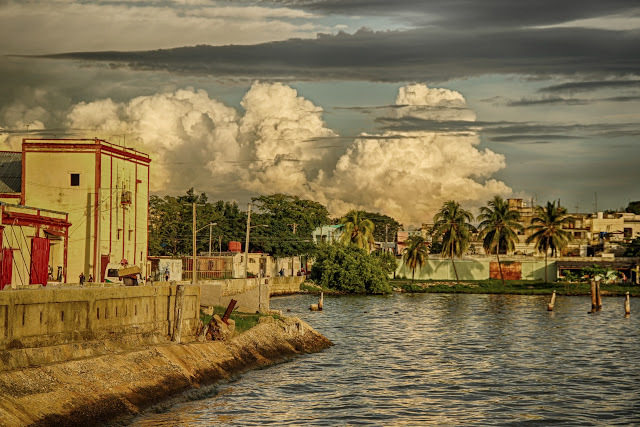 Before leaving Trinidad we visited a family ceramics business then returned to Cienfuegos. In another part of the main square, The Cienfuegos Choir amazed us with their talented singing voices...... We had (a little) time to freshen up before our farewell gathering..... thank you to Guest House Maguey for working with us on such short notice to plan such a special evening! FRIDAY Dec 11th - Morning started with a visit to Benny More Arts School, with presentations from several music and dance students. We toured their art studios as well. Ilen took us through the Farmers' Market of Cienfuegos and we had more time to get those last minute purchases taken care of before heading to Finca del Mar for our farewell lunch.... celebrated Pat Cummins' birthday.... tasty cake, too!! Within a half hour of takeoff from Miami, we could see the coastline of Cuba. The plane to Havana was a charter since the Embargo still forbids commercial flights from US to Cuba. It was operated by Cuba Travel Services and was a comfortable 40 minute flight on an American 737 jet. Some weather delay made it a bit longer, but it is truly just a 40 minute flight to this place that has been forbidden for most of my lifetime and seems so far away! The first thing we noticed after landing was the old cars. No, wait, the first thing I noticed was the uniforms of the women security agents in the airport! Mini skirts and black net stockings ... what?! But, I didn't take a picture of that. So, here's the old cars we saw from the window of our tourbus. Cars of the 1950s - not in a museum, not even a special spot, just driving along the roads. There are no product advertising billboards along the roads, but there are government/political billboards. This one caught my eye, Bloqueo, is the word Cubans use to describe the USA Embargo that prevents all commercial trade between the US and Cuba. Here is a description and timeline of the Embargo. It's because of this embargo starting in 1960 that they only have American cars from the 50s - and they've had to keep them running! With no access to parts, they even make their own. 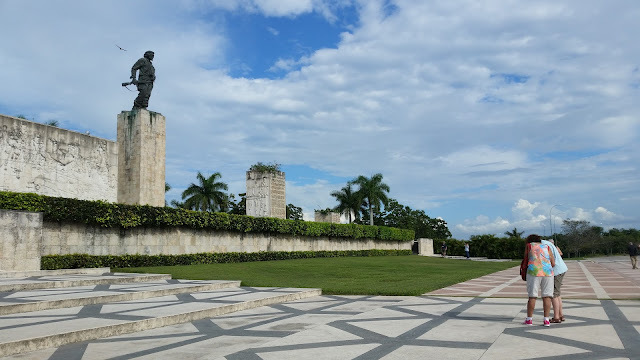 First stop - Plaza de la Revolucion. With the huge monument to their national hero Jose Marti. Jose Marti was long before Castro - his revolution was in 1895 for the Independence of Cuba from Spain ... part of the Spanish-American War. He was a poet and a writer as well as a revolutionary and he is revered as the voice of Cuban values regardless of what 'side of the aisle' you're on in today's politics. Time for lunch! Our first "Paladar" which is a privately owned restaurant. Private business is generally prohibited in this Communist country, but they are allowing certain businesses since early 2011. These businesses include restaurants and Bed and Breakfasts. Our group took advantage of both. Lunch at a privately owned restaurant, a Paladar, called La Moraleja in Havana. That was the first of many Paladars that we visited. We had great food all around ... grilled fish, shredded beef/pork/lamb - Ropa Vieja, chicken, pork chops, lobster, and of course - rice and beans and plantains. Not much in the way of vegetables, but there were a couple of places offering pasta primavera, and I remember one or two salads. You were advised not to drink the water and that included being cautious of food, like vegetables, that needed to be washed - so maybe that was part of the reason. Hey! Who needs water when you have Rum and Beer? I think they served a Mojito with every meal, and cerveza or wine was usually the second drink. 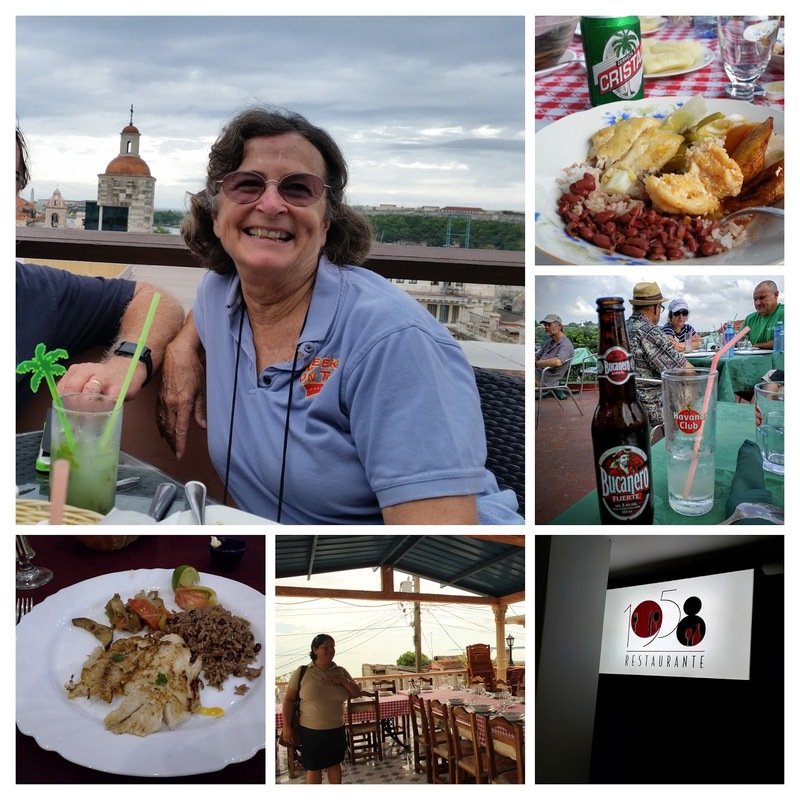 We stayed 4 nights in Havana - all at the Havana Libre hotel. It's sad to see how run down everything is. This is a first class hotel, second only to the Hotel Nacional, and we heard of people with ceiling leaks in their rooms, only 3 of the 6 elevators were working. 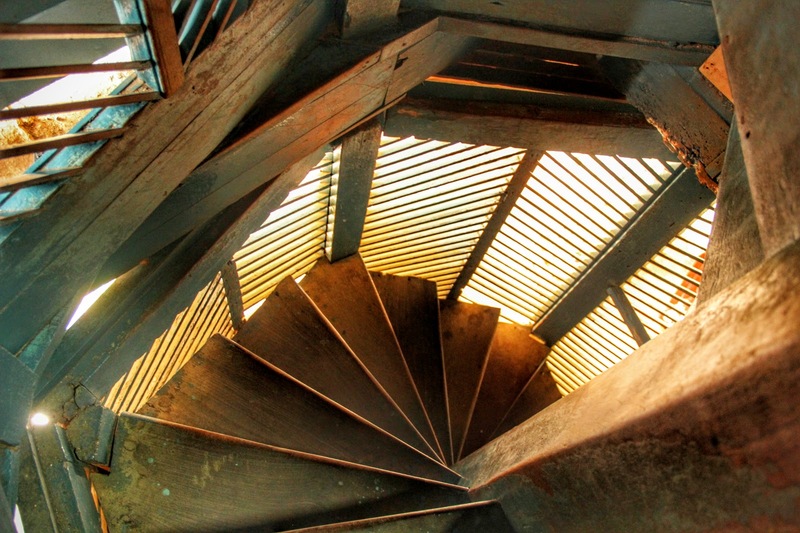 We were on the 14th floor and we resorted to the stairs one time. Our room was huge and everything worked fine - in fact the air conditioning worked too good! I was cold most of the time. And, the view was SPECTACULAR. We took pictures from our window at all times of day. And, we had a buffet breakfast every morning with everything from papaya to banana bread to ham and cheese pressed (Cuban) sandwich to omelette stations. I was surprised at the coffee though - at least in the hotel, it was weaker than our normal American coffee, not the thick black stuff we know as Cuban coffee. View from our room on the 14th floor of the Havana Libre hotel. 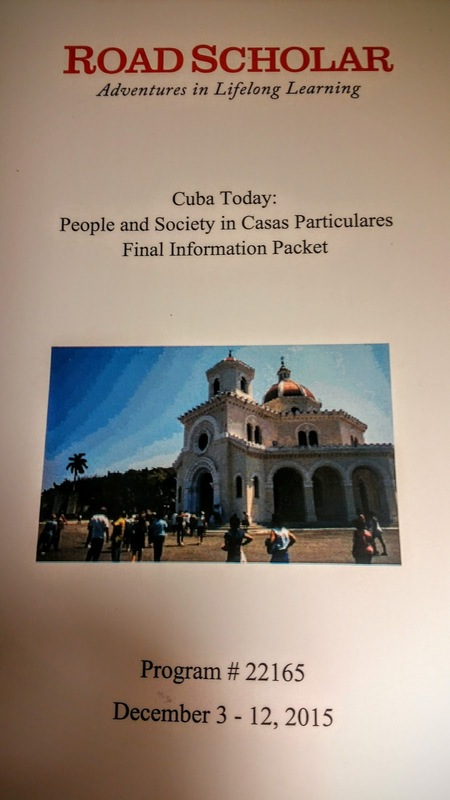 The way that Road Scholar gets a license to take US citizens to Cuba is by promising an educational experience with several "People to People" experiences every day. Jim and I both are passionate about learning ... so we were really looking forward to the lectures offered by local experts. We had 3 of these lectures while staying at the hotel. I was just a sponge, soaking up so much information on an important topic, Cuba, and one with so little prior knowledge. 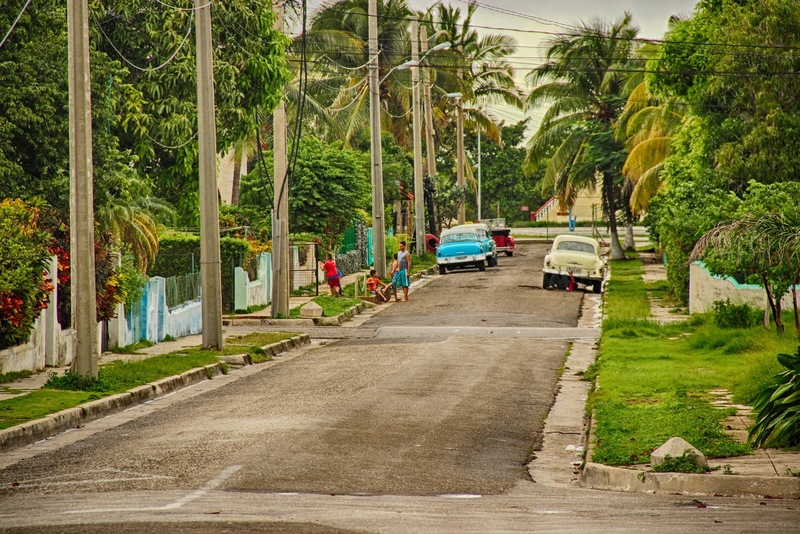 Bottom line is that Cuba is more like US than not - it's a melting pot of people and cultures. It has been 'frozen in time' as of 1960 with Fidel and Che's revolution. Now that a thaw is imminent, there is both hope and nervousness about the future. Consider if we could take the US back to where it was in 1960 - knowing what we know now - what might we want to do differently? That is the opportunity that Cuba presents. It would be such a shame for Cuba to open for business only to become another Cancun. Now that we have a context, we will be alert to any news about happenings in Cuba and will be watching with great interest. Raul Castro's term as president will end at the beginning of 2018. The presidency is limited to two terms of 5 years each - by Raul's own proposal. Let's hope the successor - probably 52 year old Miguel Diaz-Canel, has the smarts, and the heart to do the right things. In speaking of the surprise announcement 12/17/14 by President Obama about re-establishing diplomatic relations with Cuba, our lecturer told us that Fidel Castro is quoted many years ago as saying that "The embargo will be lifted when the Vatican chooses a Latin American Pope, and the United States elects a black President!" Of course, he was basically saying "when hell freezes over!" As always, truth is stranger than fiction. Another event of major importance to Cuba was the collapse of the Soviet Union in 1991. 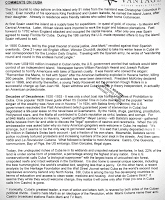 They had become totally dependent on Soviet support, with no ties to the US - Cuba was destitute in the 90s. We used our one free evening to walk from our hotel down to the Malecon (the seawall and broadwalk) and then over to the newly opened US Embasy. For the same reason we've enjoyed visiting every Presidential museum in the United States, we thrilled at being in this place where history is being made. And, here is a bit more of the a capella women's choir who serenaded us at one dinner. They brought chills to our skin and tears to our eyes they were SO good. The sea crashes over the Malecon (seawall and broad walk) as seen thru a rainy bus window. FRIDAY Dec 4th - delayed flight - Noon arrival Havana - straight to our first Paladar Lunch at La Moraleja - celebrated Nadine Sheely's birthday! drive to Revolution Square (group photo) and first looks at classic cars! Visit and tour through Colon Cemetary with Andres. 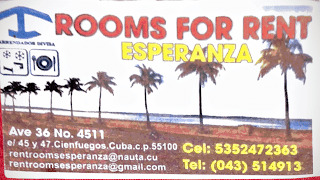 Check in at Habana Libre Hotel approx 4:30pm. buffet dinner at hotel. SUNDAY Dec 6th - buffet breakfast followed by lecture on Religion with Maritza Corrales. 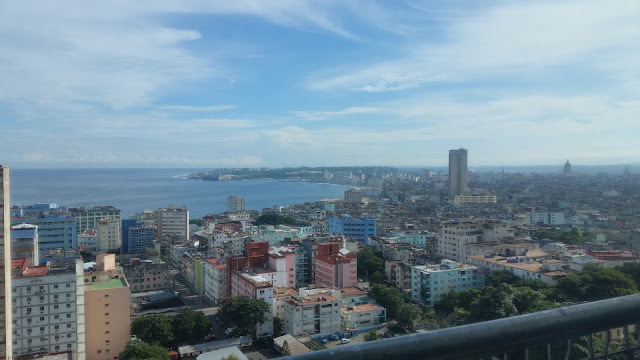 Visit and tour of Fine Arts Museum, lunch at Moneda Cubana, views of the city of Havana from the ramparts of La Cabana Fortress. Stop at Nacional Hotel before heading back to Habana Libre. Dinner was at La Fontana..... with a private concert by Vocal Luna... but the highlight for us all was the ride TO dinner in Classic Cars!! MONDAY Dec 7th - departed the hotel for a brief stop at Cigar Factory Shop... and a little rum tasting.... visited Hemingway's Home (Finca Vigia) then had lunch at La Bonita in Miramar. An afternoon performance by Mal Paso at one of Havana's Synogogues..... 4pm lecture on Cuban-US Relations by Camilo Garcia Lopez-Trigo. 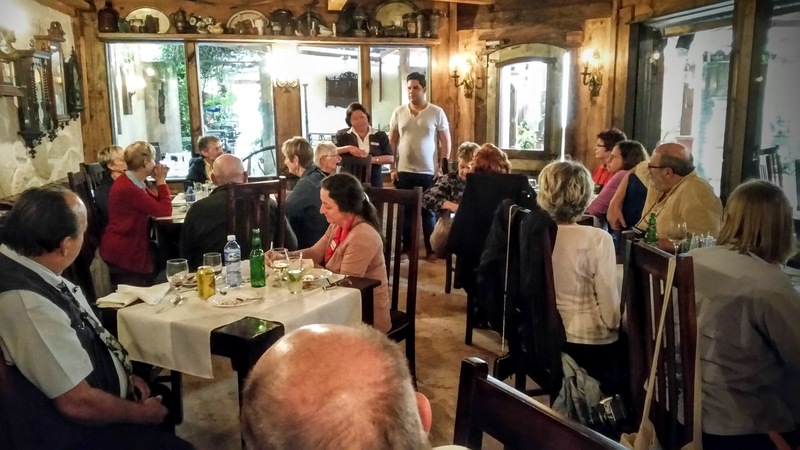 Dinner experience on your own and opportunity to enjoy an evening of music and entertainment. 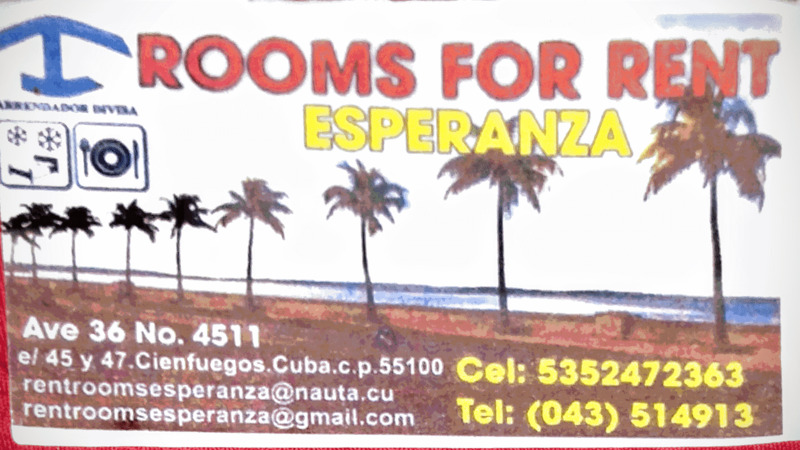 Next up - 3 days staying in a private home turned into Bed and Breakfast in Cienfuegos. 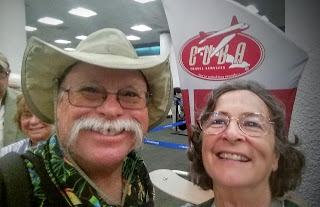 Sitting in Miami airport at 5 am waiting for our charter flight to Cuba. So excited. It's only a 40 minute flight - but a world away! 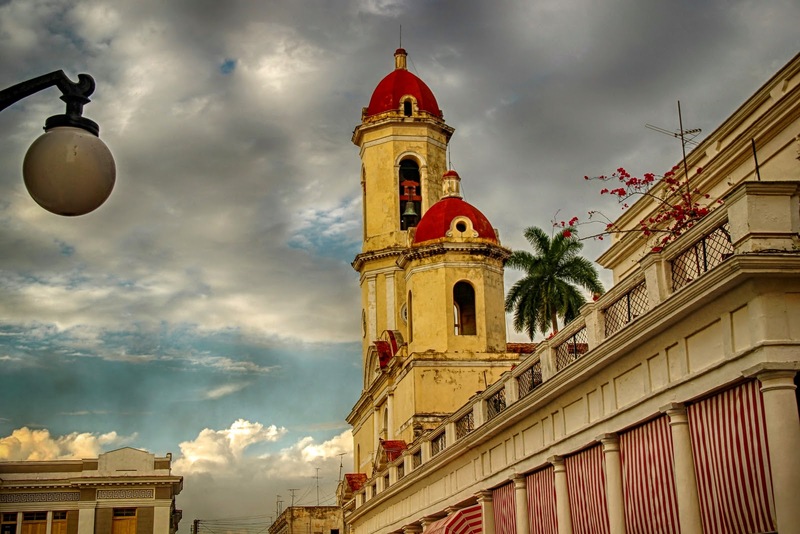 Although diplomatic relations have been reestablished, Americans still cannot take commercial flights to Cuba - you need to be on an educational tour. We signed up with Road Scholar. We are told that Internet access will be "spotty." So we won't be online much. 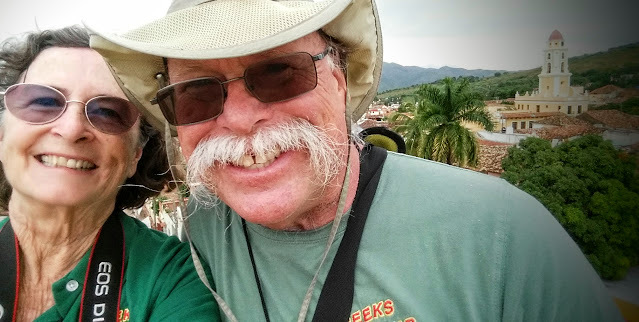 If I have any Internet at all, yu will see pictures on our Google Photos album for December - Cuba Trip. 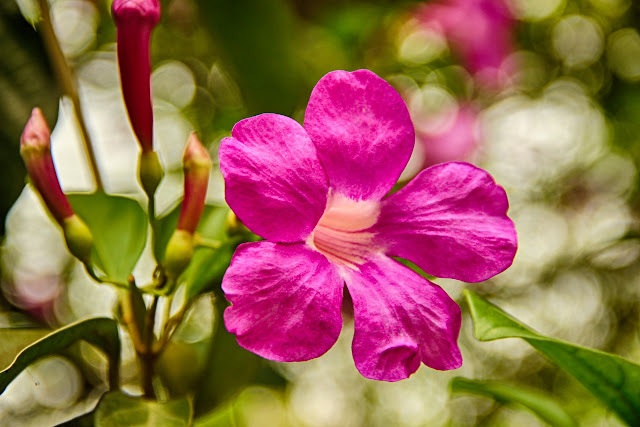 When looking at a photo, be sure to click the little i for Info and you'll see any description I've written for the picture.